Question: There seems to be some confusion, not to mention vigorous debate, within our company regarding coil-straightening equipment. I have two questions that I hope you can answer. First, is there any difference between a coil flattener and a coil straightener, or are they just two different s of saying the same thing? My second question concerns levelers. A coworker claims levelers are basically straighteners with back-up rollers that provide additional support behind the straightening rolls. I know that levelers and straighteners are different but I can’t explain how they differ. Can you explain the difference to me? A: Without a doubt, one of the most frustrating experiences we encounter in the metal-stamping industry is trying to find common terminology that is used consistently and understood broadly. Technical terms like flattening, straightening and leveling are good examples. These terms can be used so loosely that they eventually become interchangeable. When this happens it is difficult to know if there is any real difference in their meanings. This creates significant communication problems for all of us. terms commonly used to describe various coil-straightening methods. Coil straightening is accomplished by bending and unbending the incoming coil strip around several sets of rolls. The rolls alternately stretch and compress the upper and lower surfaces of the sheetmetal past its yield point until both surfaces have the same surface length. Technically speaking, this process is correcting surface-to-surface length differentials within the coil strip. Surface-to-surface differentials include coil set and crossbow. Coil set occurs when the steel sheet is coiled. The inside surface of the sheet compresses during winding while the outside surface is placed in tension, causing it to stretch slightly. As a result, the inside of the sheet ends up shorter than the outside but it is consistent across the width of the coil. Cross bow occurs when the bottom side of the material is shorter than the top side when measured across the width of the coil. This condition is usually induced during coil slitting. Fig.1 illustrates both conditions. The number of rolls in a straightening device correlates to the number of yielding strains (bends) it can produce. his in turn determines the extent of possible coil correction. The most common coil-straightening devices found in the press shop are spread-center straighteners. These straighteners usually have five or seven working rolls capable of producing three to four yielding strains. These devices are recognizable by their large roll diameters and relatively wide spacing. They can remove coil set only, and often are referred to as “flatteners.” Flatteners can satisfy the requirements for most mild steel and some HSLA applications. For the most part, these widely spaced straightener rolls are not backed up. Close-center straighteners can have as few as nine working rolls and as many as 21 or more. The rolls are spaced much closer together as compared to flatteners and usually are backed up with additional supporting rollers. These straighteners can induce at least four yielding strains, which give them the added ability to correct cross-bow problems. Another coil-shape correction device is the precision leveler (Fig. 2). Precision levelers have small-diameter rolls closely spaced with backup rollers that have the additional ability to flex the rolls individually to allow bending of the working rolls under load. This creates different path lengths across the width of the coil. In addition to correcting surface-to-surface differentials, levelers also correct the edge-to-edge differentials that straighteners cannot. Edge-to-edge differentials include conditions known as edge wave and center buckle (Fig. 3). Edge wave occurs when the edges of the coil are longer than the material along the center of the coil width. To correct edge wave, the center of the coil width must be stretched until its length is equal to the edges. Center buckle occurs when the center of the coil width is longer than its edges. To correct center buckle the edges of the coil must be stretched until their lengths are equal to the center. To summarize, straighteners are used to correct surface-to-surface differentials known as coil set and cross bow. Coil straighteners, having five or seven straightening rolls that are spaced widely apart, can only correct coil set. These devices are commonly called flatteners in order to draw a distinction between them and other types of straighteners. Join Pete Ulintz on January 19, 12 p.m. EST, for a free 75-min. webinar titled Forming High Strength Steel, sponsored by the Society of Manufacturing Engineers. Attendees can log in from remote locations or can attend at one of several U.S. host locations and benefit from networking opportunities with other attendees. The program will repeat on January 21, beginning at 6 p.m. EST. E-mail Dean Phillips, dphillips@linkelectric.com, for more information; tennessee.pma.org. 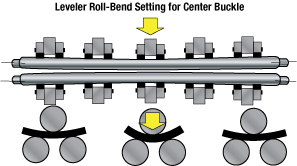 Multi-roll close-centered straighteners typically have a minimum of nine straightening rolls but they often have many more. These devices can correct cross bow and coil set, which sets these straighteners apart from flatteners. Precision levelers correct edge-to-edge differentials that straighteners cannot. The rollers on a precision leveler have the added ability to flex individually, which allows bending of the working rolls under load. I would like to offer a final word of caution: Sometimes multi-roll straighteners having backup rolls, especially those having a dozen working rolls or more, will be incorrectly referred to as levelers. Since you now know that straighteners and levelers are very different in function and capability, it is important to avoid using the two terms loosely or, worse yet, interchangeably.